Imagine a collection of vintage photographs of some of southern West Virginia’s most important musicians. Add a listening station with songs from many of those artists and you'll have an idea of what to expect if you visit the WV Music Hall of Fame's two "Music of the Coalfields" exhibits. With many photos dating back to the early-1900s, there are rare photos of Maceo Pinkard, who penned "Sweet Georgia Brown," the well-known theme song of the Harlem Globetrotters, regional promoter Ralph Weinberg (pictured with boxer Jack Dempsey) and a striking photo of Duke Ellington performing to a packed hall in Bluefield in the 1950s. Other photos feature the Ink Spots (which included Bluefield pianist Bobby Benson), a young, fiddling Sen. Byrd, Hazel Dickens, Aunt Jennie Wilson and Boone County psychobilly pioneer, Hasil Adkins. Even in the best of times, life in West Virginia was never easy. And music - always an important part of life in the Mountain State – has always been a direct reflection of that life. The dark, bittersweet melodies, many of which were borrowed from Irish and English tunes, were informed by dangerous, labor-intensive jobs; hardscrabble living; geographic isolation; a dismal economy; and, perhaps most importantly, the resilient spirit of the people. 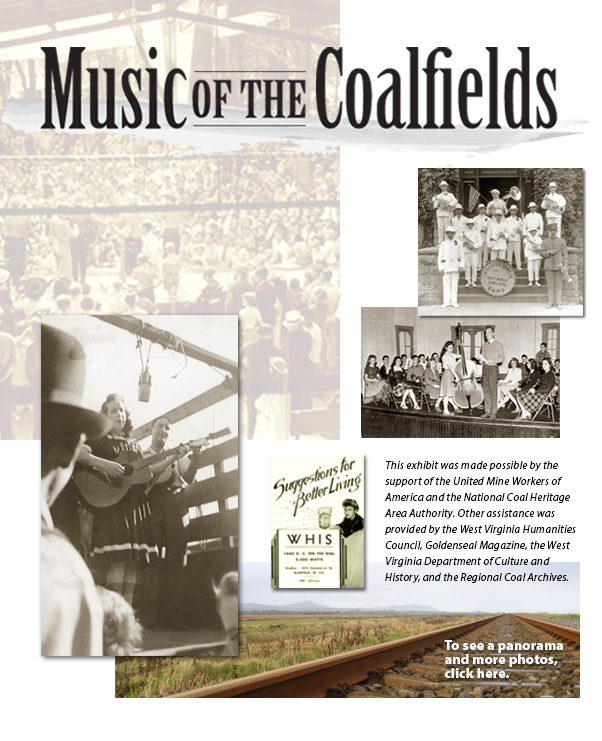 But the music heard in the Southern West Virginia coalfields also resonated with the sound of Eastern European instruments, African- American spirituals and country ballads. In the early 1900s, when thousands of immigrants flocked to the coalfields for work, they brought with them a culture of their own. Hungarians, Italians, Poles, Greeks, Lebanese and African-Americans lived together in the coal camps, each with their own distinctive culture and music.